As you may have seen on national media this week it has been the annual zoo animal stock check. This is where every animal must be accounted for, a process which zoos must go through by law in order to comply with the Zoo Licensing Act 1981. As of today we currently have 574 animals (133 species). We have to ensure every day that everyone is alive and well and as soon as it is light enough, the keepers are out on their sections doing a head count. At this time of year the head count is done when we let the birds out as most are shut away at night. It also the opportunity to check the aviaries, ensuring that the electric is on and what need a clean today. On their respective sections the keepers have the following to count – Chris has 100 animals, Rob 296 & Helen 131. Now this may look very lopsided in terms of numbers but the three sections are an equal number of aviaries. Rob has more birds by virtue of looking after the finch aviary which houses 186 birds alone. The birds are checked throughout the day as they are fed and the aviaries are cleaned. Head counts are done again when shutting in for the evening. Regular checks are important as if a bird is ill or being attacked, it’s very important that it is picked up on quickly. Asides from our charges we are also involved in wild birds counts as well. For the past couple of years we have recorded sightings and numbers of wild birds as part of a BIAZA (British & Irish Association of Zoos & Aquaria) study as to what native species are present in their collections. Following on from this, the Big Garden Birdwatch takes place this month and we will be spending an hour in the Nature Reserve on Sunday the 27th, recording whats coming to the feeders. In news this week we have had the first egg of the year laid in the Discovery Zone by the Emerald Doves. This small member of the pigeon family is found predominantly in South East Asia and bred successfully for the first time last year. 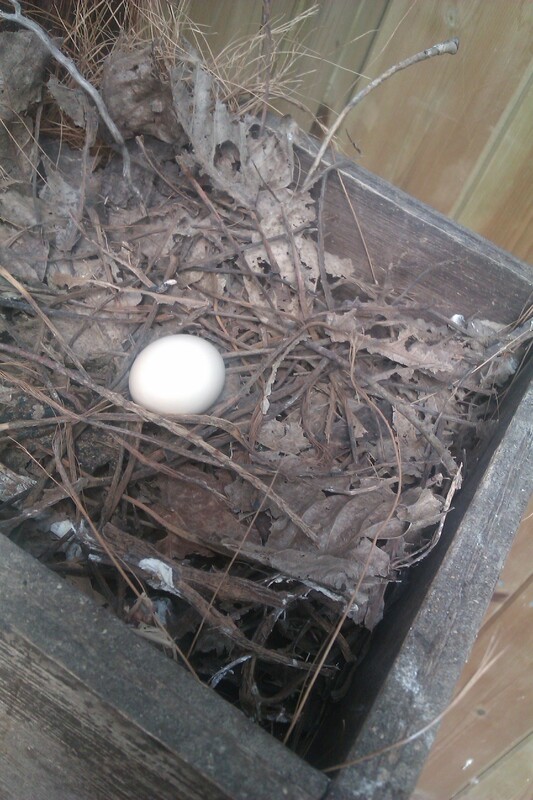 The egg has been laid in a platform provided by us and lined with leaves by the birds. It’s currently one egg but they can lay 2. Incubation is just under a fortnight so check back for updates. The flood waters have receded finally and we have been able to allow the pelicans and flamingos out for the first time for a while. It seems strange to have to shut water birds in for flooding but due to the depth and speed of the water it becomes unsafe for the birds and also for us when it comes to shutting them in. Work has started on rebuilding the Greater Flamingo shed and we hope to move them back to their enclosure in the not too distant future. Join us next week for the next blog and hopefully some updates on some forthcoming arrivals.